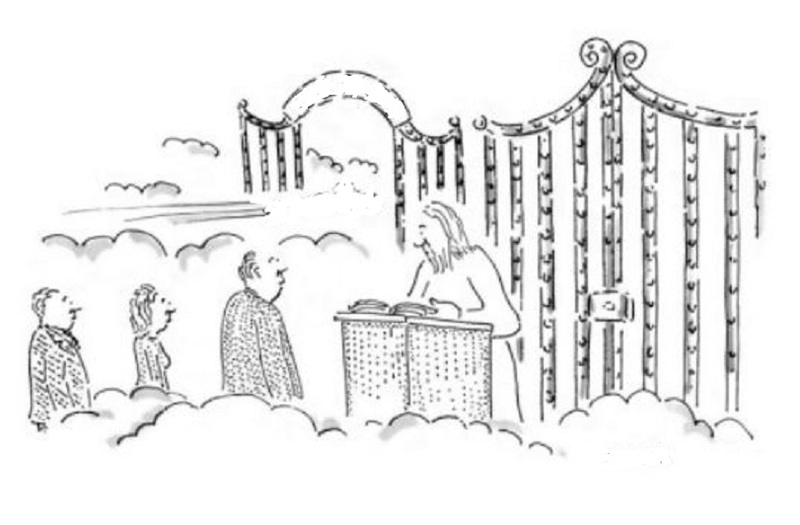 "Yes, next in line, please." "Hello. I'm a little confused. My name is ...."
"Oh, I know who you are! 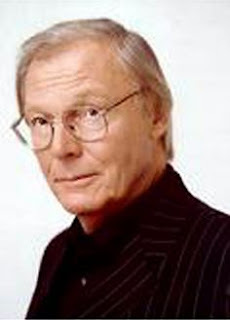 You're Adam West, television's first Batman! Welcome, I’m Peter." "Thank you, Peter. Where am I?" "Let’s just say this is Superhero Heaven. You don't really need the costume now, Adam. By the way, great eyebrows! Best of any Batman!" "Superhero Heaven? Is that why I’m in a shorter line than the others." "It's short now, but given all the superhero movies and TV shows these days in 40 or 50 years it's probably gonna be longer than the line for Larry King's ex-wives." "Yes, legendary comic book artwork. You should see the way Wonder Woman is drawn in here! Makes Gal Gadot look like Perry Block!" "But you know, I wasn't the only Batman." "Of course you weren’t. In time Michael Keaton and Christian Bale will be here as well. If not for Batman, Ben Affleck would have made it too. George Clooney's being waived in for other reasons." "It's whatever you want it to be. You can chase down the Joker and the Riddler or just play the harp. 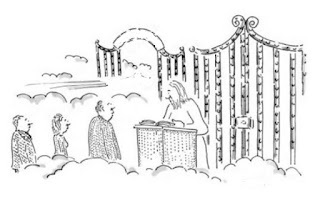 In time you get born again but we'll go over all that later." "But I'm not really Batman. There isn't any Batman." "Adam, Batman isn't a person. He's a concept, an ideal. He stands for decency, self-sacrifice, and helping others, and not being afraid to do it in unorthodox ways if necessary. And that's true whether he's portrayed as goofy, serious, or even troubled and conflicted." "But I'm not as good as all that!" "No, Adam, you played the role well. Personally I like it better played straight but you did what you could with the times." "I agree. I could have done without all the POWs and SOCKs too." Go right on in, Batman! "Don't worry, Burt Ward isn't coming here. We couldn't stand him either." Are you secretly Batman by any chance? I'm asking everybody because Cesar Romero is just driving us crazy up here! 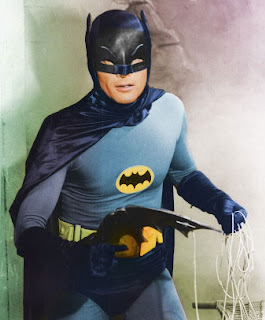 My favorite Batman! No one like him. I wonder if he would like Superhero Heaven. Some of them take themselves too seriously. Christopher Reeve would be fun to see again! I'm sure he's up there with Christopher Reeve and George Reeves right now. The place is going to be way too crowded one day with all the excessive superhero movies anymore, but these three are the charter members!